Looking for the perfect place card to create for your holiday dinner this weekend? I, too, have been drawn to all of the beautiful Easter place setting pictures I have seen in magazines, online, and on everyone’s pinterest boards. Martha Stewart has a lot of time to make these beautiful creative place cards! She’s Martha Stewart! When I make place cards – or should I say – when I actually have the time to sit down and craft something like place cards, I tend to make them more “generic” so they can be used more than once a year. After all, it is usually the same people gathering around the table for different events and holidays all year-long, isn’t it? I pick something seasonal at least, or a color that goes with a certain set of dishes. (My fine china is solid white, so that’s a bonus. Paired with pastels is great for spring, paired with red and green works for the winter holidays. ) And hey – sometimes you are using paper plates (in pretty colors of course!) First, I buy the business card paper at Staples or any office supply store. Next, I use the computer to print out the names I need – right justifying the names so that the left hand side of the business card allows for a picture to be added. (Now you have a template. Change the font and colors of the names to make different place cards.) Then, I use a stamp and markers to add the final touch. Here are the place cards from my rehearsal dinner before my wedding, four years ago! I still use them. 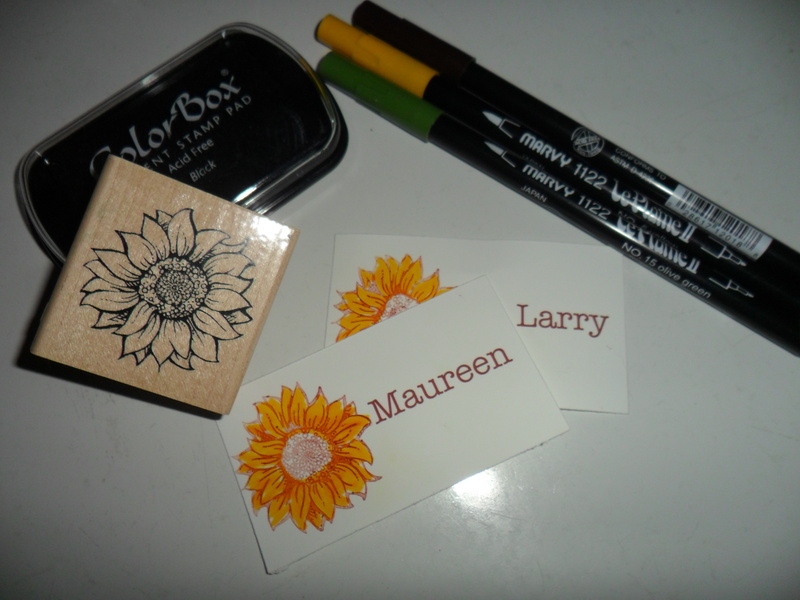 I used a basic sunflower stamp and brown stamp pad. I printed the names in brown and with markers colored the sunflower in. And yes – I walked around after the rehearsal dinner and collected them up! It’s just as nice and can be used for many months… spring, summer, even fall, if I use brown and yellow on the table. Much more versatile than an Easter Bunny. Are you sending invites out for your meal/ holiday / event? Here is our rehearsal dinner invitation. I found this card stock at AC Moore and incorporated the same sunflower stamp. 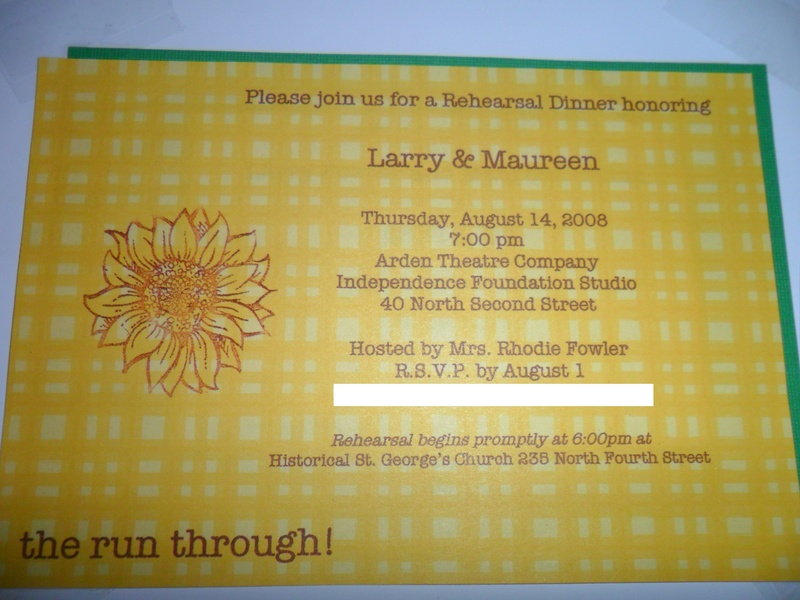 Since the card stock was yellow, I didn’t color the sunflowers in on the invitation. You can use this idea for different parties or holidays. I even found clip art that was very similar to the sunflower, so I was able to make a return address label that linked to the sunflower theme. And as you can see, I still have the place cards that I can use for multiple holidays and gatherings throughout the year. Are you using place cards this weekend? What do your favorite place cards look like? Leave me a comment and let me know. Happy crafting! Michael and I are hosting our first Easter dinner, so I wanted to do something unique and special for place-cards. Growing up, my sister and I used to dye Easter eggs (like most kids do!) but before dying the eggs, we would use crayons to decorate them and write our names. To honor that tradition and add some color to the table, I plan to write our guests’ names on eggs, dye them and place them at each setting. Guests can take their Easter egg home with them! I can’t wait to see these Angela. I am sure they will be gorgeous. Take pictures and enjoy your first Easter as the hostess!